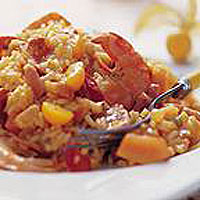 Jambalaya is a traditional Créole rice dish gaining its name from a combination of French and African words meaning ham with rice. Tropical fruits are used to complement the spicy flavour of the sauce and Chorizo, and their inclusion is guaranteed to make this dish a real talking point. Scoop out the flesh from the passion fruit and sieve to remove the seeds. Reserving a few Physalis for garnish, remove the papery leaves from the remainder and halve the fruit. Set aside with the papaya. Heat the oil in a large, heavy-based, flameproof casserole and brown the chicken. Add the lardons and Chorizo and continue cooking for a few minutes until the lardons start to brown. Stir in the rice followed by the arrabbiata sauce and the stock. Bring to the boil then cover tightly with the lid. Lower the heat and simmer gently for 10 minutes. Stir in the prepared fruits and the prawns. Cover and cook for a further 5 minutes. Adjust seasoning, cover and leave to stand off the heat for 5 minutes before serving garnished with the reserved Physalis. Use exotic fruit such as papaya, passion fruit or Physalis to top pavlova or cheesecakes, or simply serve accompanied with mascarpone cheese and sprinkled with icing sugar. Remember to provide finger bowls for guests to use after shelling the prawns.